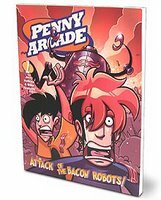 This last week I picked up a copy of Penny Arcade: Attack of the Bacon Robots! This is a collection of their works from 1998 through 2000. I’m not here to talk about the book itself, mind you. It’s true the book has some significance, as it represents Penny Arcade’s triumph over various legal issues preventing them from publishing their works for their own benefit. It is also true that the book itself is fine quality, and does an excellent job of showcasing their earlier work, despite it not necessarily being their highest caliber of comics. It focuses on their humor perfectly and runs with it, and makes for a fine walk through their early archives. But what I really wanted to discuss is Tycho’s Webcomic Manifesto published at the end of the book. It’s a nice page full of his normal style of writing (humorous but with some biting sarcasm). It takes a few pot shots at his eternal foes, the heralds of micro-payments and subscription sites. Now, the lads at Penny Arcade have scuffled with these foes on numerous occasions. Some of their attacks have been dealing with their perceived pretentiousness of web-comic artists out to reinvent the medium. My personal feeling, on some of these points, is that they go a little overboard. I certainly agree that to endorse “experimentation and reinvention as the only way to be a true artist” is, well, dumb. But I also think that it is perfectly fine for those people who want to have their experiments to go and try some of the artisticly incredible things that are only available through the wonders of the computer and the internet. Interesting things can come of invention and reinvention. Significant and powerful works can be developed. It shouldn’t become the only way of art, but nor should it be dismissed as nothing but pretentiousness – the truth is somewhere in the middle. However, there is a completely seperate debate that I feel is a much trickier issue. It can be hard to seperate the topic of ‘subscription methods’ from the topic of ‘artistic pretentiousness’, since both topics revolve very heavily around the same person. Penny Arcade have launched attacks on this front as well, and it is a follow-up on that area of discussion that motivates the Manifesto Tycho lays out at the back of his book. The core of his argument is this: “Readers will take care of you.” Give away your comics for free. Use merchandise and other means of revenue, and your readers will support you. Denying your readers comics until they pay you is no way for a comic to operate – it is cold and mercantile, and lacks trust in one’s readers. He speaks from personal experience – and no one can deny Penny Arcade has done well for itself. I think there is truth to what he says, though it is not the universal truth he might wish it to be. Being a free comic that relies on alternate methods of revenue – books, merchandise, advertising and so forth – is the only real chance that one has to hit it big, in my opinion. However, it is also the path that is not guaranteed to reach that point. Being part of a quality subscription service, on the other hand, is a moderately reliable means of reaching a middle ground – where there is some return revenue, though not enough to make a living off of. However – it also denies one forever the chance to truly make it big on one’s own. I love webcomics. I read hundreds, of all levels of quality. I even belong to several of the afore-mentioned subscription sites. At the same time, however… I hate belonging to them. The only reason I do so is because webcomics I was already a fan of for years moved onto their service, and I was willing to spend the money for those comics. If those services did not have comics I had already had years of free service to fall in love with, I doubt I would have come to them. The readership of any service that charges an entrance fee will always be far inferior to the populace that will partake of something for free. Denying others entrance to your comic will not enhance your readership. I can’t emphasize that enough. There are too many other webcomics available on the internet for free. You will have some readers, and each one will be significant due to the entrance fee – but that same fee will also hold you back. I think Tycho’s logic is really a good starting point, if not the whole answer. Use your webcomic to gather your readers, then expand from there. It isn’t a guarantee – not every webcomic will gain enough readers to meet the point at which it becomes a living. Not every reader can even afford to support more than a handful of their favorite webcomic authors. But accepting your readers and making them welcome is the first step. My rant here is also motivated by a post by the creator of Accidental Centaurs. The strip itself is a decent one, though by no means one of the web’s heavy hitters. Its method of monetary acquisition appears to be a combination of commissions, booksales, and donations. The number of strips he produces each month is based on how much money is donated. That attitude towards your readers? Not a healthy one. Guilting your readers into giving you money is not a tactic that will work – it isn’t something you can call upon every month. Especially not in that way. Let your readers know that if your comic can’t make you the money you need from it, then you won’t be able to continue it – sure, that’s fine. But “threatening” your readers? That’s crossing a line. In the end, it isn’t just a matter of what you are doing – it is a matter of how you do it. R.K. Milholland, of Something Positive fame, is well known for telling his reader that if they would donate a year’s salary, he would do the comic full time. And it worked – he got the money, and was floored. Then he nodded, and went to work on the comic, and figured out how to make it his job without having to rely on a yearly salary in donations. It worked once, but he knew it wasn’t going to cut it as an annual thing – it was up to him now. Last I heard, he’s doing pretty well, and his comic remains one of the big ones in the webcomic world. Overall, this isn’t so much a rant about what money-making method a webcomic uses. This is more about attitude. Tycho is definitely right about one thing – treat your readers with trust. Treat them well and with respect. Deliver them your content as best as you can, rather than making it feel like an afterthought. That really is step one to producing a web-comic. Have a community – have a forum for readers to gather and chat, both about your comic and other things. Be accessible yourself – have a place for readers to email you. You don’t have to respond to every email, but at least allowing readers to *send* you emails is important. Have information about your comic. Have a cast page, even if only a small one. Basically, make your comic friendly to your readers. Once a reader feels welcome, they are far more willing to invest and support the comic. On a side-note, I find it interesting that Penny Arcade is often considered as a ‘sell-out’, with their ‘merchandising’ and ‘advertising’ and so forth. And yet – they are the ones who advocate a method of selling your comic that involves giving it, for free, to readers, rather than charging a fee at the door. It’s different in other industries. I can’t go out and get a bunch of print comics for free every day – I have to pay for the ones I want, by and large. The internet changes things, however. I can find quality free webcomics every which way I turn. And if I am looking for a new comic, and need to decide whether to spend my time on one freely available, or one that will cost me to see what it is like… well, not a hard decision to make, in my opinion. You aren’t guaranteed to suddenly make a living if you put your hopes and dreams in the hands of your readers. But you stand a much better chance of getting those readers and keeping them if you deal with them fairly – and that is the first step to truly going places with your webcomic. There are more and more webcomics every day that are finding themselves able to support a living – not always well, not always easily, but they can do it. And they are also, almost without exception, webcomics that treat their readers well. I’m impressed, dude. This essay is well thought out and succinctly and convincingly put, and I tend to generally agree with what you said. Good stuff. I’ve been generally impressed with everything you’ve been doing, it’s all been high-quailty stuff. Keep up the good work. Yeah, I have been pleased by my ability to keep the content coming. I think right now I might need to work on getting out a few less intensive essays, though, after this last one.